Snow peas are entirely edible and known as the “mange-tout” in French which means “eat it all”. Snow peas are completely edible when they are young and tender, a pale to medium green in colour and they have flat crisp, firm pods that are usually one and a half to three inches long. Inside these flat and wide pods are tiny undeveloped sweet peas. When a slight bulge of the tiny seeds is barely visible, snow peas are at their prime for eating. These peas are elegant, have a delicate sweet taste and a meaty, crisp texture. Did you know that Snow peas are also called sugar peas and Chinese peas? 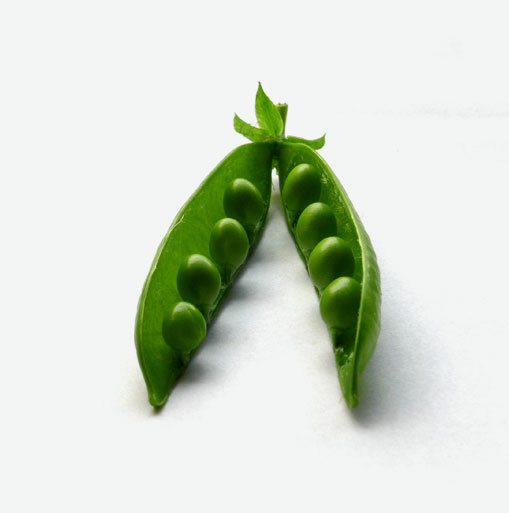 Green peas are slightly larger and somewhat bulkier looking. These peas are usually shelled from their pods and used in all sorts of dishes. The pods are usually composted. Peas are an excellent source of protein, and carbohydrates. They are a great source of fiber, vitamin C, vitamin A, iron, folic acid, potassium and calcium. Snow peas are higher in calcium and vitamin A than other type of peas, and they are lower in calories. Just a three and a half ounce serving contains about 43 calories. To store peas, refrigerate them in a perforated plastic bag. Use within a day or two for optimum quality. Choose fresh peas that are firm and have a medium green colour. Watch out for soft, limp pods or blemishes. Snow peas, sugar or snap peas and green peas are versatile but are the most delicious in stir-fries and soups. They can be served as a veggie by themselves or they can be married up with shrimp, pork or chicken dishes.